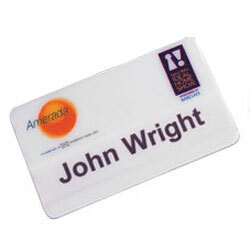 Ideally suited to conference delegates or staff identification in a customer facing role. Quality conference name badges for extended use and can be reused for future staff. Screen printed in reverse on clear PVC to give a scratch proof finish. Manufactured from three layers of PVC to provide a slot to take a card insert. Inserts supplied in A4 sheets. Supplied fitted with a standard pin to the reverse. Standard sizes available are: 40 x 70mm - 45 x 75mm - 51 x 76mm - 55 x 75mm. Please contact us for price details.